If you are in a machine shop, then you probably need a dial indicator. These instruments have been a staple in every shop since the early 1900's because of their ease-of-use and are easy to read. Every machinist or metrologist should have a dial indicator at their ready. You can use a dial indicator for checking cylindrical parts in a chuck, measuring the depth of holes, making sure edges are square, and checking the run out variation. You can even attach the dial indicator to a test stand so you can measure by comparison. Dial indicators provide good resolution for a very low cost. 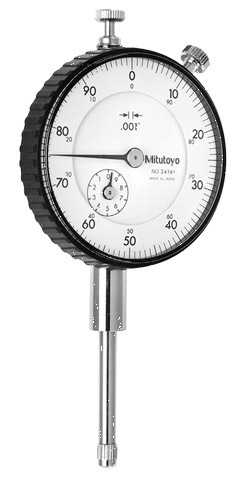 Get one of our Dial drop indicators from all leading manufacturers: Brown & Sharpe, Mitutoyo, Mahr Federal, Fowler, Starrett, SPI and more. All the dial indicators come in different ranges and sizes. Long form certificate of calibration available for gages and precision hand tools from our in-house calibration lab.